This step-by-step guide will illustrate you how to upgrade to Windows 10 using ISO file, from your existing Windows installation. So as far as upgrading the OS is concerned, the steps are little bit different. Here you need to temporarily mount the ISO file by assigning it a drive letter, then you can proceed via upgrade. 2. A device that can run Windows 10, or that fulfills system requirements for Windows 10. 1. Open your existing Windows edition and locate the ISO file. Now right click on this file and Mount, restart the machine. After rebooting, open File Explorer and locate the DVD drive, you’ll find that the ISO file is already mounted to it with a temporary drive letter (as you can see in below shown window, where D: is temporary drive letter). Open this drive and click on the setup.exe file. 4. Moving on, accept the license agreement from Microsoft by clicking Accept. Best option here is to select Keep personal files, apps and Windows settings. Click Next and then click Install in above shown window. 6. Finally, the installation starts and get completes in few minutes. Your PC will restart after the installation is over. 7. After reboot, you will see the Upgrading Windows. Here there are three sections and after completing each section, PC will restart. When this screen reaches to 100%, system will finally reboot. 8. After the restart, the steps are similar to step 11, 12, 13 of this guide. Then you can log in to your user account which existed on your old edition of Windows. Click Next. 9. After setting up your account, finally you’ll arrive at the Desktop of Windows 10. In this way, the upgrade to Windows 10 is completed. How can I get an Installation DVD of Windows 10? The upgrade is not working for me. Thank You for your help in the past. I have been trying to get windows 10 from a free upgrade. So far it has not worked. I think the installation DVD would work. How can I get a free DVD, or can I? are my files and there locations effected when upgrading? ^^ Nope. But games may not work after upgrade, if they’re not supported on Windows 10. No way for skipping product key ? I wanna stuck on there. ^^ You can directly download ISO file from Microsoft using link mentioned in the article. Once you’ve ISO file, go ahead with steps. After restarting there is no pre-mounted drive. i got to where it says the computer started using the windows installation etc….How do I actaully restart the computer once i removed the cd There is no option about restarting unless you press the power button which I did and ya operating system not found..back from scratch. ^^ In that case, physical restart is the only option left. Hi, im stuck at where it says “Hi there, let’s get a few basic things out of the way, what’s your country/region?, what keyboard layout.., etc”. So yeah, i chose my settings and now it’s taking forever to apply these settings. Prior to this, i chose “keep nothing” for a clean installationg. Any help? Going over half an hour and still “applying these settings”. ^^ If it’s still there, can you go back and check Use Express settings button? Hey Kapil, it appears that I am a similar situation just like Benjie, When I get to the ‘Compatibility’ report that says remove my USB install media, I have a restart button on my desktop that I can press. I go thru the stated set of instructions: 1) remove the USB media; 2) Press my restart button; 3) Wait for the machine to reboot into my old Windows 7 (32bit) Sp1 OS; 4) Wait for that start-up to complete; 5) Reinsert the USB media and tell Win-login page to restart my machine; 6) On this occurrence the same Initialize process starts all over again w/o regard for the initiating files that should have been written to my harddrive from the prior install attempt. Effectively I’m in a never ending loop with no chance of a successful continuance of the reinstall process. How can I get this issue resolved. ^^ Give it some time, it will pass. This depends upon your system specs. i cant change the date if i change the date it wont load it will restart again and the msg will appear again what should i do? Hi.. Everything was working fine. 2 days ago my Acer 4740G running on Windows 10 Pro 64bit is updating to its latest update, a commulative update. At 68% percent the laptop suddenly turned off due to the plug is a bit loose and it was moved a bit and boom laptop died. Now I cant open it, asking me for a bootable device. I made a bootable USB and making an install, trying for upgrade because I dont have back up of my files. Then compatibility report keeps showing (The computer started using the Windows installation media. Remove the installation media and restart your computer……). When I clicked close it brings me back to Windows setup where you choose install now or repair your computer. I dont even know how I’ll restart it. Please help me.. :( Thank you.. This for this guide BUT I have a computer error and I cannot load Windows. Currently I only have access to my hard drive via CMD in the TROUBLESHOOTING option in the windows installation media. Is it possible to execute your guide with just CMD? Can I use Daemon tools to mount image to a virtual drive? ^^ Sorry, can’t comment on such 3rd-party tools. Hi Kapil. Came across ur post. Pls I have a windows 10 that I have been using for the past two years. Some 3 weeks ago I tried booting my system. It refused to go to the login page and remained stuck on a blue screen and rounded dots. I have tried so many solutions to no avail. Kindly help assist me sole this problem. My Dell Vostro 3560 laptop was upgraded from Windows 7 Pro to Windows 10 Pro Build 1511 using an old ISO file and it worked fine. In the process, Windows 10 Pro was activated automatically for free. Then, it tried to automatically upgrade via Windows updates to Build 1809 and it stopped about 54% of the way and rolled back to Build 1511. Unfortunately, it is now no longer activated and cannot be rolled back to Windows 7 Pro anymore. The reason that Build 1809 failed may be because some drivers are not available yet for this laptop model. 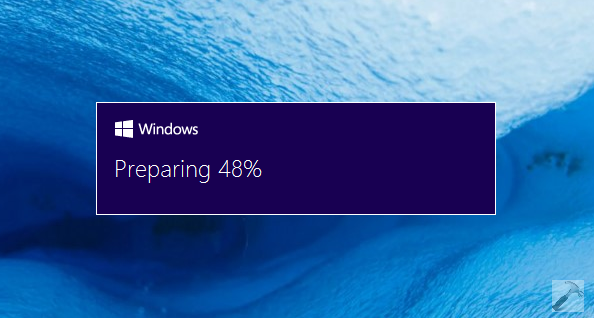 Hence, it ran fine at Build 1511 and I can defer further upgrades to higher Builds and only update Build 1511 with available Windows updates but I can no longer activate it. Please provide guidance to fix this issue. Contrary to what all of the discussion groups are saying, Microsoft told me that upgrading from Windows 7 to Windows 10 is no longer free and that I should buy a new Windows 10 license. The initial successful upgrade to build 1511 was performed on February 22, 2019. I lost the digital license when it tried to upgrade to build 1809 and then rolled back.